Because some people take this book really, really seriously. Source: This was the Infographic of the day in Fast Company blog written by Mark Wilson on July 25th. There are two ways to read The Great Gatsby. The first is as a tome of idolization, filled with extravagance to be coveted and characters to be concerned for. The second is as a cautionary hyperbole to giving the slightest of craps regarding the vapid comings and goings of the uber rich and famous–even those depicted in The Great Gatsby itself. If you read the book the second way, you pity the parts of society that read it the first way. You laugh when Baz Luhrmann exposes that universe as gaudy and The New Yorker throws a monocled hissy fit, and you shed a tear for your beloved high school English teacher who carries around a well-worn paperback at all times, every word of which has been underlined during a never-ending loop of rereading. Yet even someone as unenlightened (or uncultured?) as I can appreciate Pop Chart Lab’s scene-by-scene print of Fitzgerald’s most famous novel. The top is a map of all the locations where the book took place. 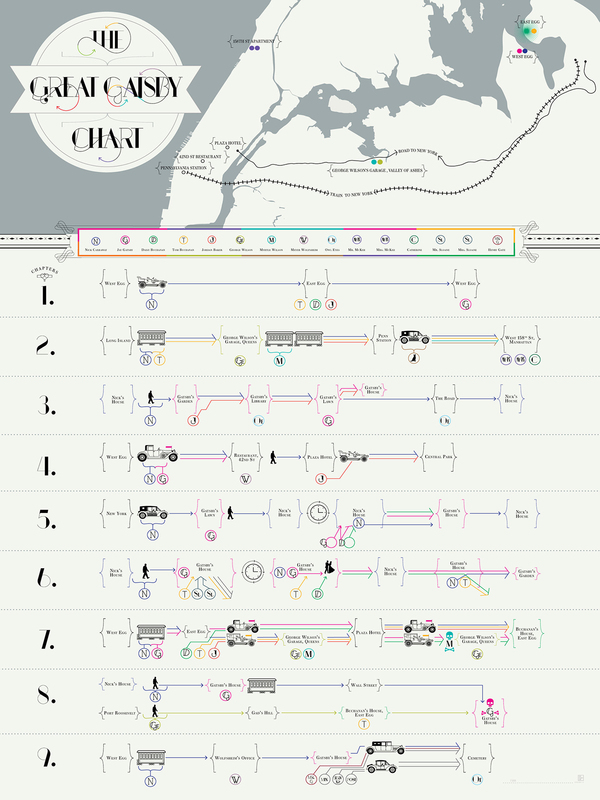 The bottom is a nine-chapter timeline, depicting every train ride, car cruise, and walk-and-talk connecting each character in the novel. Indeed, in the hands of Pop Chart Labs, the book appears to be, not a series of parties or conversations, but one roaring race toward Gatsby’s demise. I can certainly respect that approach, but will I care? Never. 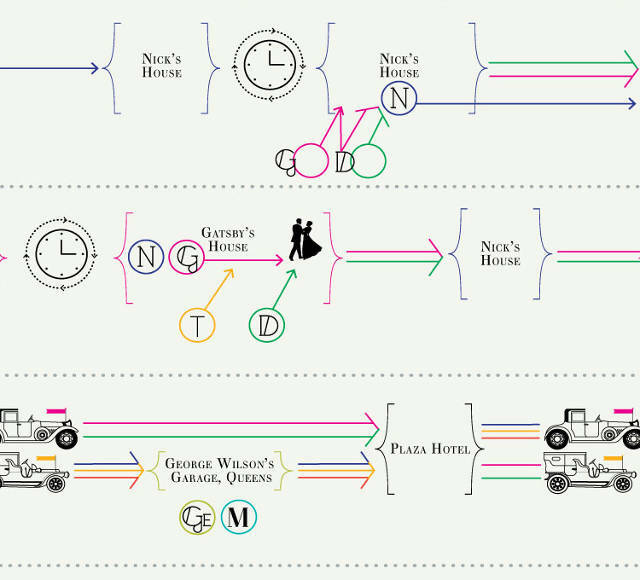 This is the story of The Great Gatsby. It’s a somewhat unconventional retelling. Each chapter has its own mini timeline. And each character has their own color to comprise that timeline. What we end up seeing is how the story unfolds, scene by scene. In other words, we see the locations shift and various characters hop in and out of the narrative. Some of these timelines become a bit frantic, like when Gatsby nervously disappears from Nick’s house when being reunited with Daisy. And that’s the idea: It’s a visualization of the constant social juggling going on through the book. Do you by chance own this poster/info graphic? It is no longer available on the producers website and I am interested in purchasing it for use in my classroom. No, I do not. Sorry. Thanks for visiting.